To use a tag library you need to import jar libraries containing the implementation and define tags that invoke functions inside the library. 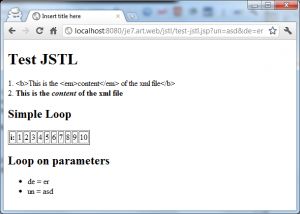 You can find jstl-1.2.jar on the web or from this local archive. 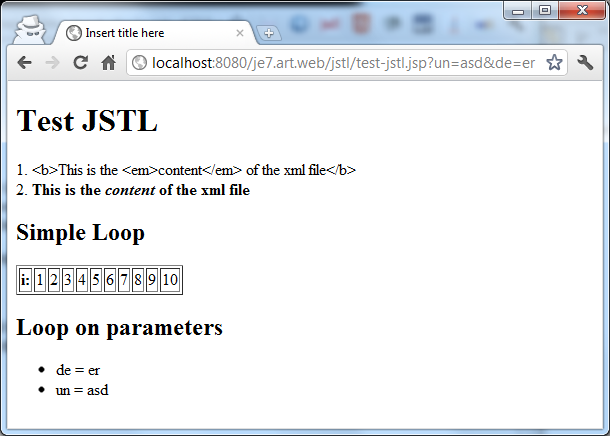 Since the jat we’ve copied contains both libraries and TLD definitions, we can start to use JSTL tags. To use them, first we need reference JSTL with a declaration at top of JSP. In the shippet below we reference the jstl/core library, whose tags are available under the prefix “c:” . Then we could put some JSTL tags inside the page. The second list page parameters. Take care that param is an implicit Map object. The result, obvious, are a table and a list. But instead to watch the picture, you can build yourself.